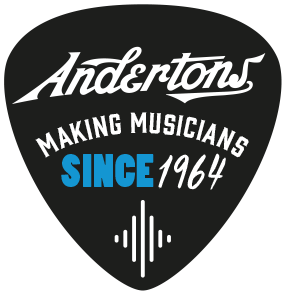 Guildford Store Info - Andertons Music Co.
Our Flagship Guildford store is the heart of Andertons Music Co. In store you'll find our four specialist departments where you can ask for advice as well as take advantage of our Click & Collect service. We have hundreds of guitars in stock and on display for you to try out. From the latest releases to iconic instruments. Not to mention 4 well stocked pedal & effects cabinets and walls of amplifiers. Our drum showroom has everything from full acoustic kits to electric kits and accessories. Whether you're just after some sticks or a complete custom order setup, our specialist team are on hand to make sure you're well stocked. We have a speaker demo room packed with the latest studio monitors, not to mention a wide range of live audio, PA and DJ gear ready to try! Come and check out our wall of synths! On display and available to try, we have a number of keyboards, stage pianos, digital pianos and synths from Nord, Yamaha, Casio and many more available. This is where it all began - we've been making musicians for over 50 years! From beginners to professionals, young and old. Come to our store and the find the gear that you love in a relaxed environment. We'd love to see you! We have free parking directly outside our store. When this is full, there are several bays on the surrounding roads which have free parking for 2 hours. If you need more time, however, there are some great options within a 5-minute walk of the store. All of these are open 8am-10pm Mon-Sat and 11am-10pm on Sunday. It's easy to get from London to Guildford train station, which is just a five minute walk away from the store. Trains regularly run direct from London Waterloo, Clapham Junction, Wimbledon, Vauxhall and Gatwick. Waterloo - train departures every 15 mins or less. 35 min journey. Clapham Junction - every 20 mins or less. 30 min journey. Wimbledon - every 25 mins or less. 50 min journey. Vauxhall - every 30 mins or less. Change at Clapham for 45 min journey. Gatwick - direct trains every one or two hours. Changes at Clapham half-hourly. 45 min journey.